This page is aimed to shed some light on the current systems that operate to the detriment of ALTs - who are practically all non-Japanese (NJ). - Why do BOEs outsource ALT teaching jobs. - The difference between direct employ, sub-contract and dispatch contracts. - What is illegal about a sub-contract ALT working at a public school. - The tender bid process. - How much money do dispatch companies make from ALTs? - Dispatch company ALT and health insurance. - How dispatch companies and BOEs get rid of ALTs they don't like. - Ministry of Education tells BOEs to directly employ ALTs - BOEs ignore directive. - Labour Standards Office issue reprimand, BOE has head in the sand. - How the sub-contracting system damages other teachers in the industry. - Why the Fukuoka General Union is fighting for direct employment. Up until a few years ago most local governments procured their Assistant Language Teachers (ALTs) through the JET program. However, with local government budgets tightening, they began looking for ways to cut expenditure. The cost of keeping a JET was about 6 million yen per year, so when they were approached by dispatch companies which offered to do it for less they jumped on the bandwagon. But not only did they save money, they outsourced the management of the ALTs, getting the dispatch company to take on the troublesome chore of getting the ALT accommodation, assimilating them into Japanese society and taking care of any trouble that arises. Like a cancer the number of non-JET ALTs at public schools increased to a point where they make up the bulk of ALTs in Fukuoka (and other) Prefectures. To outsource the ALT teaching jobs, they have determined that it is a "service" (業務 gyomu). SCAM 1: ALT jobs have been deemed a "service" so local governments can save money and avoid the management of foreign employees. The Board of Education (BOE), which is in charge of placing ALTs at their schools outsources the work to the dispatch companies like Interac, OWLS and KBS. However the type of contract that they make with the Dispatch company is at the core of the problem. This is what all JET ALTs and some non-JETs get. They are directly employed by the BOE (City/town). Conditions are usually much better than the outsourced worker. ALT and Union can negotiate directly with BOE. What is illegal about a sub-contracted ALT? An ALT, by definition, is an assistant. They assist the Japanese Teacher of English (JTE), so the JTE must tell the ALT what to do. However a sub-contracted ALT cannot receive ANY direction or evaluation from the JET before, during or after the class. 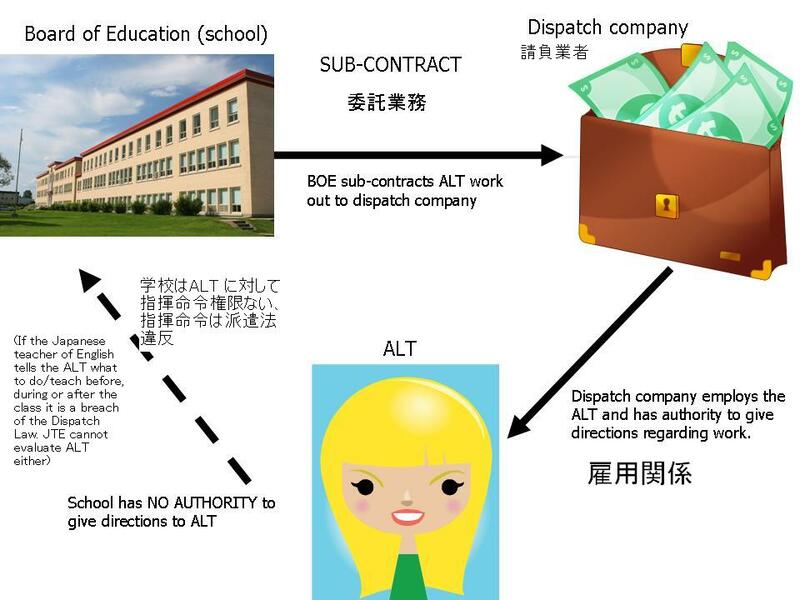 If a JTE, or anyone at the school tells the ALT what to teach, how to teach or evaluates the ALT, it is illegal under the dispatch law (派遣法). However, let’s suppose that the JTE does nothing, doesn’t tell the ALT what to do and gives them a free hand to do what they want. This would breach the Education Law as the teacher must have a (Japanese) teacher’s licence to teach a class. The Ministry of Education has issued a clear directive stating that an ALT must plan lessons with the JET, and evaluate each other. In the same directive it stated that a sub-contracted ALT cannot be evaluated by, or plan lessons with a JTE. Either way the system breaches the law, but the BOE, and especially the dispatch company ignore this. Despite the subcontracting of ALT work breaching the law, and the MOE directing BOEs to hire ALTs directly and not to sub-contract, they still do. ALTs are mostly procured by tender bid process. I might add that ALTs (gaijin) are the only teachers ever to be “procured” by tender. It is a “tender by proposal” （企画入札）therefore the proposals are submitted and the company with the best proposal wins the tender. Criteria for adjudging the best proposal is here. As you can see there is very little regarding teaching in the classroom, with more weight being placed on administrative ability of the dispatch company. The criteria for evaluation of the proposals concentrate on a) the number of ALTs registered with the dispatch company and b) the ability of the dispatch company to manage the ALTs. There is very little criteria relating to classroom work. There is even an item relating to work with the community - something that the school should definitely not subcontract out. This process means that the current 30 ALTs working at Prefectural High Schools will not know if they will have a job after March until March 18, and even then it will not be for a year, but only 3 months and 1 week. In 2009, 4 companies submitted proposals, with the successful company (OWLS) submitting a quote and eventually signing a contract for 122,183,250 yen. As of December 2009, 8 ALTs, or 26% had quit. Here is another (hard to believe) fact relating to the quote. The successful dispatch company is notified and then submits a quote by fax to the BOE. If that quote is above the upper limit of designated by the Prefecture for the ALTs, the dispatch company is notified and asked to submit another quote. If the dispatch company decided that the upper limit is too low (and not worth bidding for) the second best proposal gets a chance to bid. In reality, the winning bidder can submit as many quotes as they like until they reach the upper limit the Prefecture has set. For the BOE and dispatch company it is a convenient system. For the ALT and the education system it is an unstable, unfair system that has no future. As you can see in the Fukuoka Prefecture BOE tender, the successful bidder will not be notified until March 18. However, the dispatch company must have a number of ALTs on their books (registered with the company) for the tender bid proposal. Therefore, the dispatch companies advertise on Gaijinpot and Fukuoka Now etc. for ALT jobs ? that they don’t yet have. Phantom jobs! In the case of the 4 dispatch companies, only OWLS teachers got jobs. All the people who registered with KBS, Interac and American Chatterbox for the ALT positions, well bad luck. And if OWLS do not win the bid, then all their ALTs will lose their jobs too. The dispatch companies do not mention that they don’t yet have the jobs they are advertising for. False Advertising!? SCAM 4: Most ALT jobs advertised will not eventuate because they do not exsist and nobody knows if they will eventuate. How much is an ALT worth? Each BOE sets their own upper limit for each bid, so each city/town will spend a different amount per ALT. To get an idea of how much the BOE pays for each ALT per year/month it is just a matter of dividing the total amount by the number of ALTs. Another ridiculous side of the sub-contracting system is that these contracts are subject to 5% consumption tax. In other words, 5% of the ALTs salary goes in tax, then on top of that they pay income tax. This system unfairly double taxes the ALT. (Direct hire is not subject to consumption tax). Below is a table showing how much BOEs in Fukuoka are paying for ALTs. The Fukuoka 2009 Prefecture ALT contract includes 5,818,250 yen in consumption tax and 100,000 yen in stamp duty. This works out to 197,275 yen per ALT going in tax, that would not be applicable if the ALTs were direct hire. Kitakyushu City sub-contracts work out by the class, rather than by the ALT, therefore a contract will be for a certain number of classes. Therefore, to work out how much OWLS was paid for a certain contract I divided the number of classes taught (as per reports submitted by OWLS to the Kitakyushu BOE) by the total amount of the contract. Contract Contract total	Number of classes taught	Average amount paid per 40 minute class	Consumption tax per class. Dispatch company ALT and health insurance. This is a very complex issue, but the bottom line is that dispatch companies do everything they can to avoid enrolling their ALTs in public health and pension, known as Shakai Hoken (SH). Despite what they tell the ALTs about the cost, them main drive behind their unwillingness is that the dispatch company MUST pay 50% of the SH cost. This usually works out to about 25,000 to 30,000 yen per month (depending on income). It is on parity with the National Health Insurance (Kokumin Kenko Hoken [KKH]) but is more expensive than private (travel) insurance. (The FGU advises members not to join private insurance if at all possible as foreigners in Japan are obliged to join either SH or KKH). One way that unscrupulous dispatch companies avoid enrolment is by making employment contracts less than 30 hours per week. This is to try and create an “out” by calling on a government advisory that states that to be eligible for SH an employee must work APPROXIMATELY three quarters of a regular full time employee. Seeing the normal working week is 40 hours, anything under 30 hours is less than three quarters. Therefore, by making contracts 29.5 hours work per week, the company claims that the ALT is under the threshold. It should be noted that the FGU believes that even teaching 29.5 hours per week ALTs are eligible as the advisory states that it is APPROXIMATELY three quarters （概ね3/4）. By avoiding enrolling ALTs in SH a dispatch company saves 25,000 yen per month per ALT. A company like Interac which has 5000 ALTs would save 1.5 billion yen per year. And just because you are enrolled in private health insurance, it doesn’t mean that you are absolved from enrolling in SH or KKH. One ALT, who was enrolled in private health insurance was hit with a bill form 2 years back payment for KKH. When he didn’t pay it he had money seized from his bank account. Then, after cleaning out his bank account, the city then went on to seize his salary. The city will let the dispatch company weasel out of enrolling ALTs in SH, but they will hit you with big bills for not enrolling in KKH. In addition, to weasel out of SH dispatch companies limit working time to less than 6 hours per day (5.9), but they demand that ALTs be at the school from 8:30 to 5:00. This means that there are a couple of hours that the ALT must be at the school, but do not get paid, because they are not working. If they sit around web surfing, other teachers will say they are slacking off. click here for Fukuoka Pref HS ALT contract and specified hours. The Japanese teaching staff are not aware of this situation. By the dispatch company avoiding SH, it enables them to provide cheaper labour to the BOE. Therefore, the BOE benefits from the dispatch company ignoring working conditions. This must stop. How dispatch companies and BOEs get rid of ALTs they don't like. To get rid of a JET is a long involved process, as the BOE, being the employer, has responsibility for hiring the ALT in the first place. Under the sub-contracting system, a simple phone call can result in an ALT getting kicked out. Despite the BOE, school and JTE being prohibited from evaluating an ALT, they do, and if they do not like one, a simple phone call from the BOE to the dispatch company will result in an ALT losing his job. This actually happened with an OWLS ALT in Yanagawa. The BOE told OWLS that “if he kept on at the school they would not be able to reach the required level”, so OWLS told him that he had no work and tried to get him to quit. (He didn’t quit, he came to the FGU). OWLS tried not to pay him, but the FGU forced OWLS to pay out the rest of his contract. 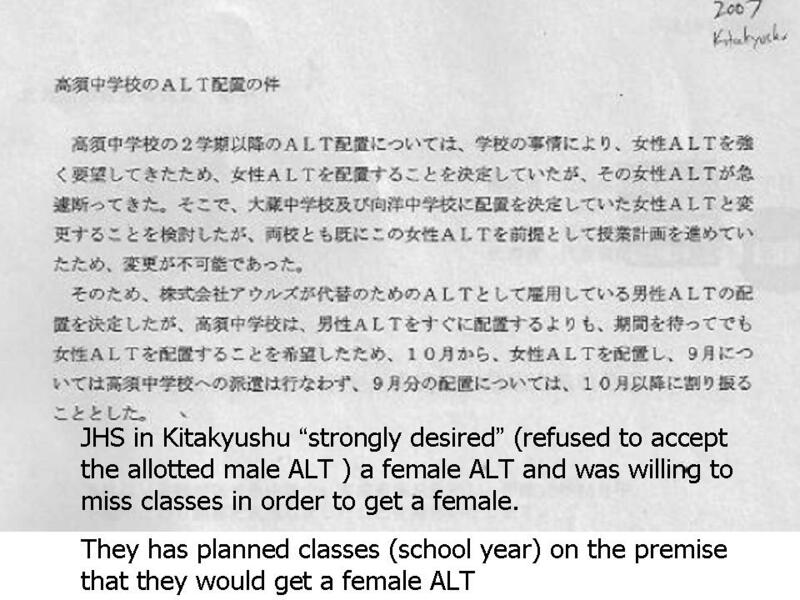 In another case, a school demanded a female ALT, to replace the male ALT that was allotted to them. Their reason was that they “had planned the curriculum on the premise of a female teacher coming to the school”. This was a co-ed public school in Kitakyushu. To keep in the good books with the BOE, the dispatch company will walk all over ALTs. In 2005 the Ministry of Education (MOE) issued a directive (MOE directive16-121, 17 Feb 2005) stating that sub-contracting ALTs may contravene the dispatch laws and that they “should endeavour to directly hire excellent ALTs”. Despite these two clear directives, BOEs continue to sub-contract out ALT jobs. Dispatch companies also word employment contracts so that the ALT is prohibited from seeking direct employment from BOE, and threatens penalties if the ALT does. Also, they get (con) BOEs into the sub-contract to include a clause stating that they won't attempt to employ the ALT directly. What does this mean? That if either the BOE or the ALT approach each other the dispatch company can (try to) sue for breach of contract. In other words, if the BOE or ALT follow the MOEs directive they may be in breach of contract. The dispatch companies are walking all over the MOE instructions. Labour Standards Office issue reprimand, BOE has head in the sand. In December 2009 OWLS was issued with an official reprimand from the Labour Standards Office (労働基準監督署　是正勧告書) for illegally deducting a penalty from an ALT who quit mid-contract. OWLS has a policy of making ALTs sign an "Agreement” when they sign their contract. It states that if the ALT resigns mid-contract OWLS can deduct a penalty of 114,000 yen from the salary. This practice is illegal and clearly breaches article 16 of the Labour Standards Law (prohibiting penalties for non-performance of contract of employment). OWLS were forced to pay back the money. Nevertheless, no OWLS teachers, all of which signed the “Agreement”, were told by OWLS that they had breached labour law. What is worse, is that the BOE has no way of knowing that OWLS has been breaking labour law, another incentive from them to carry on with the practice. How the sub-contracting system damages other teachers in the industry. Dispatch companies are continuing to reduce working conditions for ALTs. Some ALTs are only employed for the school term (April to mid July, Sept to Dec Jan to Mar) and are left unemployed during the school holidays. Turning teaching English into a “service” (gyomu 業務) dehumanizes the occupation. Dispatch companies increase their influence and lower the bar for all occupations. It has been reported that some universities are starting to outsource classes to dispatch companies. Also, the fact that FOREIGNERS are the only teachers subject to this practice. When this was pointed out to a BOE representative, the reply was “But we subcontract the security work out also”. Equating ALTs with security guards that drive around at night and check schools just goes to show the mentality. Japanese teachers should be concerned because if the trend continues, it could happen to art, music, and home science teaching as well ? it could be turned into a “service”. Why the Fukuoka General Union is fighting for direct employment. Since dispatch companies have been replacing ALTs from the JET program, working conditions have deteriorated. Pay has dropped, stability has been eroded, and the revolving door of non-JET ALTs shows that the system is in a mess. Local government BOEs have a moral responsibility to look after their employees. However, by outsourcing the ALT “service” they can let the dispatch company do their dirty work and claim impunity. BOEs need to abide by the law, take responsibility for ALTs employment and provide a better education for students in their care. ALTs are not only at schools to teach English, they are there to nurture international understanding and promote international exchange. This is the opposite to what BOEs that outsource are doing. Provide stable jobs for ALTs. Demand direct employment. Whether you are an ALT or not this issue is at the core of foreigners' working conditions and rights. Putting pressure on the MOE to follow up on their directives. Helping members who have been ripped off by their dispatch company. Help the Union, Help Somebody, Help Yourself. Document 4 Attachment to document 3 defining the role of an ALT in a team teaching role. 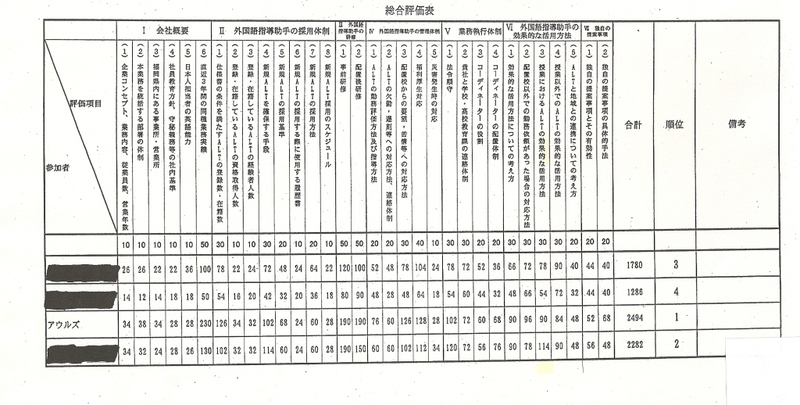 Onojo City Tender Bid results (KBS and OWLS with OWLS winning) for ALT "service" 2009-2012 school years. These TV news reports provide a good summary of the "scam" and how it adversely affects foreign workers. We recommend ALTs to get their Japanese Teachers of English (JTEs) and other school teachers/workers to watch these news reports so they can see the truth behind the scam.